Questions are very important, especially when you are trying to learn something new. When I read books that are hard to understand or are simply thick and intimidating–naturally I feel bored, discouraged, and have a difficult time concentrating on them. However, I recently made a great discovery! When I have a particular question in mind and I am looking for the answer in the book I am reading, I find it much more interesting and easier to stay engaged. Sometimes I become so engrossed that I am shocked when I see how much time has passed while reading something that I previously found tedious and difficult. I have a theory. I think that the human mind is naturally driven to rid itself of anything that makes it feel uneasy. And when a question pops up in your mind, that causes uneasiness. When you hear a quiz-type of question, doesn’t it bug you until you find out the answer? Basically, your brain can’t stand not knowing something. So, this creates a natural curiosity that drives the mind seek the answers to questions, so it can return to a happy and balanced state of knowing. Perhaps our ancestors developed this thirst for answering questions in order to survive in nature. Maybe this is ingrained down to our very genes. I find that different types of question create different levels of mental uneasiness. And since we are looking at questions as a way to motivate us to learn, the bigger that uneasiness, the better. “How” questions are also very good. They can indicate surprise like “How is it possible?” which also indicates a gap between what is and what you expected. “What” questions, on the other hand, are not quite as useful. They indicate that you don’t know something, but they don’t include any feeling of mystery or intrigue. However, sometimes you have to start out with a “what” question. For example when you start learning “Ruby on Rails,” the first question that might occur to you is “What the heck is ‘Ruby on Rails’ anyway?” So the first thing to do is to get a quick answer for that initial “what” question, and then to come up with a more detailed “why” or “how” question that will keep your mind engaged. “How does ‘Ruby on Rails’ make web application development more agile?” is a good example. So, when you have a question, think of it as a wonderful opportunity! It can be a great learning motivator and a catalyst for you to focus. When a question occurs to you, lifelog it in Tagaabo with a question tag before you forget it. 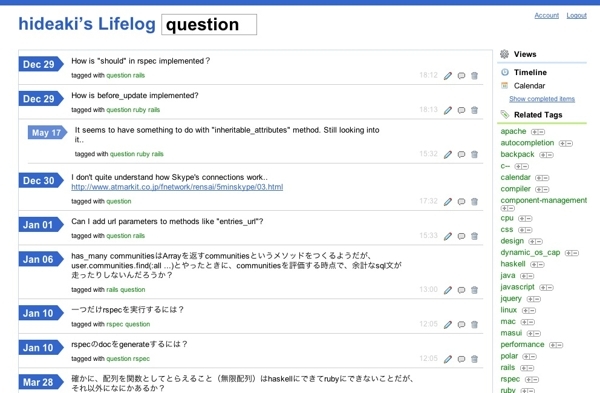 My questions listed in Tagaabo looks like this. Staying on top of all the questions that pop up everyday is a fabulous way to keep track of what you want to learn about, as well as to accelerate your learning process.